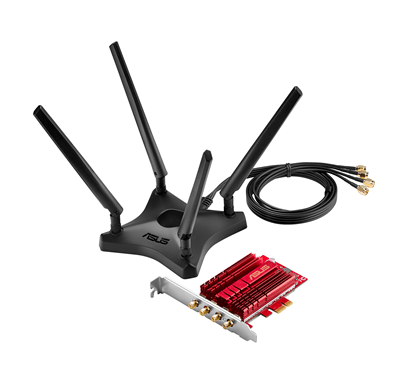 7 September 2016 — ASUS today announced PCE-AC88, a dual-band 802.11ac Wi-Fi PCI Express (PCIe) adapter that instantly upgrades a desktop PC to the latest ultra-fast wireless standard. PCE-AC88 is the first PCIe adapter to feature a 4×4 (4 transmit, 4 receive) MIMO design that delivers AC3100-class speeds of up to 2100Mbps on the 5GHz band and 1000Mbps on the 2.4GHz band. For the best signal reception, PCE-AC88 includes a magnetic antenna base that allows flexible placement of the four detachable external antennas on any suitable surface. PCE-AC88 allows PC users to take advantage of the latest high-speed 802.11ac routers, which offer wireless speeds that match or exceed wired Gigabit Ethernet networking speeds. When paired with a 4×4 802.11ac router, PCE-AC88 unleashes the full performance and coverage potential of the 4×4 MIMO technology, but it is also backward-compatible with all existing Wi-Fi standards. The latest ultra-fast 4×4 802.11ac routers require compatible 4×4 Wi-Fi clients in order to unlock the full potential and speed of the 4×4 MIMO architecture. ASUS PCE-AC88 is the first 4×4 802.11ac PCIe adapter for desktop PCs, and uses NitroQAM (1024-QAM) technology to unleash full 4×4 data speeds of up to 2100Mbps on the 5GHz frequency band and up to 1000Mbps on the 2.4Ghz band — speeds that are up to 60% faster than a 3×3 802.11ac adapter. With these faster-than-wired speeds, users can upgrade their desktop PC instantly to enjoy the benefits of smooth streaming and latency-free online gaming. ASUS PCE-AC88 is equipped with four external detachable antennas to provide wide coverage and stable signals. The antennas are attached to a convenient magnetic base for flexible placement that can be ASUS PCE-AC88 is equipped with four external detachable antennas to provide wide coverage and stable signals. The antennas are attached to a convenient magnetic base for flexible placement that can be n under the heaviest loads, PCE-AC88 features a custom heatsink design for optimum heat dissipation, resulting in improved stability and reliability.